Jivi Mobiles has partnered with Reliance Jio to offer a 4G-enabled VoLTE smartphone at an effective price of Rs 699. Reliance Jio is currently offering cashback of Rs 2,200 under its new Jio Football offer. The offer is applicable on a wide range of smartphones from various brands. However, Jivi Energy E3 is the only smartphone that costs Rs 699 -- after deducting the cashback from the actual cost of the device. The Energy E3 has a retail price of Rs 2,899. Under the Jio Football offer, Reliance is offering 44 vouchers of Rs 50 each on recharge of Rs 198 and Rs 299. 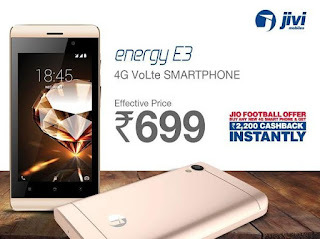 The total value of recharge voucher is Rs 2,200, which when deducted from the retail price of Energy E3 brings down the effective cost to Rs 699 (Rs 2,899 – Rs 2,200 = Rs 699)Jivi Energy E3 is one of the eligible devices to get the offer from Reliance Jio. Other phones include Energy E12, Prime P300, Revolution TnT3 , Prime P444 and Prime P30. The offer is valid until March 31 and can be availed using MyJio app only. The cashback vouchers would be credited after first successful recharge of Rs 198 or Rs 299. The 44 vouchers of Rs 50 each would then be credited into the subscriber’s MyJio account, which can be used against subsequent recharges.